[In 1981, the Social Democratic Party was formed after a right wing split away from the Labour Party in protest at the left-wing policies of the Labour Party under Michael Foot. In the aftermath, the right-wing inside the Labour Party found their hand strengthened and they were able to help shift the Labour Party away from the left towards the centre, replacing the 'hard left' Foot with the 'soft left' leader Neil Kinnock in 1983 after the general election that year which Thatcher won thanks in no small part to the split anti-Tory vote. In February 2019, the Independent Group represent a similar split away from the left-wing led Labour Party under Jeremy Corbyn (even though his policies are formally nowhere near as left-wing as those of the 1980s Labour Party but are merely advocating mild basic social-democratic policies), and now the Labour right under the leadership of deputy leader Tom Watson are putting pressure on the left - leading to a shift in Labour's position with respect to Brexit to satisfy the interests of British big business, and also to the suspension of the 'hard left' Chris Williamson MP from the Labour Party for standing up to right-wing smears against Corbyn's Labour Party. What is going on? 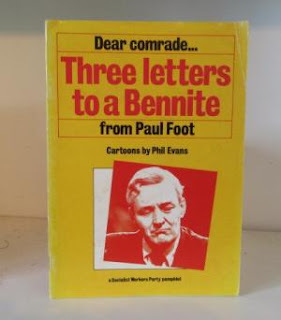 History never repeats itself exactly (we are in a different political situation to the early 1980s in many ways), but it rhymes, and given this it seems timely to republish some extracts from the 1982 Socialist Workers' Party pamphlet Three Letters to a Bennite by the brilliant socialist journalist Paul Foot to see if any of the pamphlet might speak to Corbynites today. 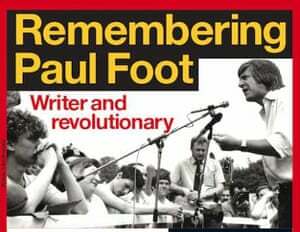 Sadly Paul Foot died in 2004, so he himself is unable to write a similar pamphlet 'Three Letters to a Corbynite' for our times, but in the absence of that perhaps something might still be learnt from some of the general points about the nature of Labourism that he made back then]. It was, also, that I was glad at the result, I’d been impressed, too, more than I dared admit at the campaign by Tony Benn and his supporters...I suppose what I liked was the straight appeal to socialist solutions – the open attack on capitalism and all its works. Have you read the Brandt Report? It’s a pretty boring document of course, and you have to fight your way from paragraph to paragraph. But what a picture it presents of the world. Nearly a thousand million people, most of them children under the age of five, are, quite literally, starving to death. One half of one percent, I repeat, one half of one per cent of the money spent on armaments would be enough to pay for the investment in agriculture which would not only feed these people, but guarantee that their children would be fed too. Yet there is not the slightest sign of anyone taking any steps at all to plan for a decrease in military spending and an increase in spending on food. On the contrary, the less the world produces of useful things because of the economic crisis, the more is spent on an arsenal of destruction which could already kill us all a hundred times over. The Brandt Report and all the people who worry about it (including dear old Grocer Heath who used to be a hated Tory Prime Minister but now comes across as a kind old man who worries about world poverty), are always getting very het up about what they call ‘oil surpluses’. They say: ‘Oh, dear, look at all those profits which the feudal sheikhs of Arabia and the oil companies are making out of oil. These should be put to helping the poor and underprivileged.’ That’s called ‘recycling the oil surpluses’ by television experts who have to find phrases that no one understands. Of course it’s madness to have vast profits from oil on the one hand, and starving people who can’t afford food, let alone oil, on the other. But that’s capitalism. That’s the ‘right’ of people to do what they like with their own property. And of course the people who are making those surpluses (and it includes shareholders in oil companies as well as the sheikhs and their hangers-on in Arabia) want their ill-gotten gains to ‘grow’ just as fast as possible. So the ‘surpluses’ chase themselves round the world money markets looking for the highest interest rates, and the world’s poor people have to pay yet again in higher prices to keep the ‘surpluses’ growing. As long as the people of the world pay service to the claimed ‘right’ of the propertied few to use their profits as they wish, the ‘recycling of oil surpluses’ to benefit the world’s poor stands not a snowball’s chance in hell. Everywhere we look there is this infernal division between rich and poor. It runs all our lives. It is class interest, not people’s interest, that directs what happens to the wealth that is produced, to the price of the goods we need to buy, the kind of houses we live in, the schools our children go to, the health service we get when we are ill. The greed and callousness of the class that holds power seem to get worse every day. I have just read a report in the press which says that 1,400 workers in Invergordon in Scotland will lose their jobs because British Aluminium is closing down a smelter there. The report is jubilant. ‘Shares of both British Aluminium and its parent. Tube Investments, ended the day with net gains,’ it says. In other words, the shareholders made a profit because their company threw 1,400 workers on the dole, causing them and their families appalling distress and probable future hardship. And the same disgusting pattern is replaced right across the world, with the few glutting themselves on the hardship of the many. What other solution to all this is there but to replace the anarchy of the market with a planned economy, in which resources are put to work to meet people’s needs; to replace the divisions in society with the principle of equality, by which people put in what they can and take out roughly the same; to replace the Tory slogan of ‘each for himself with the principle of collective insurance, with everyone guaranteed at least the necessities of life – food, clothing, housing, health care, transport and so on. I am preaching to the converted, I know, and going on a bit. But I think it was because of all this that I found Tony Benn’s summer and autumn campaign so exhilarating. He was talking socialism in terms at once more easy to understand and more powerful than anything which had come out of the Labour Left in my adult life. And the result was to electrify the political scene. Interest in politics on the Left soared. Mass meetings of the most extraordinary size and enthusiasm were staged by your people all over the country. Tony Benn himself was enthused by it. He started cracking jokes instead of the rather wooden sermonising which cramped his style in the past. He found ways of beating the media at their own game, and became a popular and exciting television personality. Even when he worked himself into hospital, his campaign did not stop. I remember your letters last autumn in which you spoke of the enthusiasm in and around your local Labour Party; the increase in membership, especially young members; the formation of women’s groups which involved themselves in the problems of local people; the sudden injection of informed political discussion into Labour Party meetings. And yet ... and yet. Just to mention the early 1970s is to remind me of the reason for my caution about it all, why I refused to join you as you went over the top (and oh, yes, you did. I have kept your letters in one of which you actually describe Tony Benn as a ‘Messiah’!) ...there was the miners’ strike of 1972 which broke Heath’s pay policy. Then there was the imprisonment of the five dockers under the Industrial Relations Act, and their release after the TUC had called for an all-out general strike. There were strikes and sit-ins everywhere. Building workers, engineering workers, hospital workers, all took part in national stoppages. Thousands of jobs were saved at Fisher Bendix on Merseyside and at Meriden in the Midlands. Finally, another miners’ strike knocked Heath right off his perch. The working class movement never lost its confidence. Though unemployment climbed to a million, no closure was safe from occupation and sit-in. Though Heath had a wages policy, first voluntary, then compulsory, no Minister could guarantee that it would not be broken by industrial action. The mood of confidence on our side led to retreat on theirs. Now compare those early days of the 1970s with the early 1980s. The general picture is completely different...The working-class movement is not broken, as it was for instance in the 1930s. But ordinary trade union organisation has deteriorated out of all recognition...This is the background to what you so joyously described in your October letter as ‘the greatest advance for labour in all its history’. And that brings me to the most interesting part of your letter. You speak of the turmoil in your local Labour Party, where all was militant unity a few weeks ago. You write bitterly of the ‘traitors’ who are not prepared even to send a resolution to the national executive supporting Tariq Ali, when a few weeks ago they were shouting for Tony Benn. You are also hard on the ‘diehards’ as you call them, the Militant Group supporters, who, you write, ‘are set on destroying everything we have built up’. Forgive me if I point out that it is not quite clear where you stand. Are you really for an uncompromising battle ‘for the soul of the Labour Party’ as you rather ridiculously put it? Are you for another deputy leadership fight next year? Or are you for letting bygones by bygones and trying to paper over the cracks until the next election? Some hard men on the Labour Left want all right-wingers out of the Labour Party and into the SDP. They want a Bennite Labour Party, and to hell with what happens in the election. If a Left-wing Labour Party can get 20 per cent at the election and 100 seats, they will be quite happy. But will you be? Do you want the Right expelled or forced out? And are you prepared to pay the price for it in terms of the electoral defeat, which is, as even Tony Benn must agree, a certain consequence? The ‘hard men’ argue very much like the members of the ILP in the early 1930s, who said: ‘These Labour right-wingers are disgusting. Let’s ditch them and have a new party, a left-wing party which will win the voters.’ But the history of the ILP, which remained wedded first and foremost to the idea of winning power through parliament, is a sad one. The ILP disintegrated, for, given this perspective, most ILP members were pulled towards the party which seemed most likely to win elections. And why not? If political change is to come from laws passed in parliament, then surely a social democratic party which can win elections, however much it compromises with the Right, is better than a party pure in socialist dogma, but which can never win elections? No wonder that you supporters of Tony Benn are quarrelling so. For it is an awful choice: turn to the right, or tear your party to pieces and hand the next election to Roy Jenkins or David Steel? I won’t expand on this now, until I’ve heard from you again, but that choice is forced on you by your own obsession with electoral politics and therefore with the Labour Party. There is, as you know well enough, a socialist way out of both. THANKS for adding ‘Happy New Year’ at the end of your letter, to reassure me that we are still friends. We’ve had all these arguments out before, but I never remember you quite so angry. You accuse me of ‘crowing’ over your political predicament as though I take some sort of pleasure in seeing other socialists in discomfort. I assure you that is not so, and you have misread me. I’ll come later to what I really feel about you and all who think like you, but first I must answer an even more urgent charge. You say, with some justification, that ‘like all sectarians’ I spend 99 percent of my time and energy attacking everyone else and only 1 per cent offering any sort of solution. As an example, you take a paragraph at the end of my last letter criticising your ‘obsession with electoral polities’. Just what does that mean, you ask? Am I against any elections at all? Do I imagine that society can be changed by some kind of coup? Is my socialism a system where the advance guard of the working class appoint themselves to rule with the help of compulsory examinations in the writings of Marx and Lenin? No, I am not against elections. I think that anyone in political or economic authority over anyone else must be elected – or the authority is illegitimate. I am for a ‘representative democracy’ every bit as much as Tom Paine was when he wrote The Rights of Man nearly 200 years ago. Indeed, a representative democracy is, as far as I am concerned, central to socialism. The difference between a socialist and a non-socialist democrat is that the socialist wants democracy in every field of public life. We want economic and industrial democracy as well as parliamentary democracy. We want to see not just those who make the laws elected, but those who enforce them elected too – the judges, the police, the armed forces. We want to see those in authority in the factories and workplaces subject to election too, and those who control the media. Socialism, in other words is an extension of what democracy we have, not the removal of it. What is true of our vision of socialism is also, as it must be, true of our attitude to the labour movement now. What use is a shop steward, for instance, unless he or she is elected by the union members he or she represents, and can be recalled by them? I also object when I am described as ‘anti-parliamentary’, as though I were in favour of dispensing with votes for parliament and local authorities, as any Fascist is. I am not. I realise just as you do that the right to vote, and all the other freedoms which spring from that, which include for instance the right to publish Socialist Worker, were rights won from the propertied hierarchies of the past. The idea that everyone should vote for their government didn’t come from the reforming consciences of the rich, who once ruled quite happily through a parliament which wasn’t remotely democratic. It came from the growing clamour of the voteless people; their marches, meetings, demonstrations and strikes. It came out of the agitations of Chartists and suffragettes. And it was conceded reluctantly, gingerly, in dribs and drabs over a hundred years (if you include giving the vote to 18-year-olds, well over a hundred years). These concessions went against the grain of the ruling hierarchy, and to some extent they still run against the grain. So whenever there is a clash between one or other of the unelected hierarchies and the elected representatives, we socialists instinctively support the parliament and the councils. When the Law Lords declared the other day that the elected Greater London Council could not subsidise transport and fares as it had promised in its Labour manifesto, there was no question of standing aside and laughing at the ‘dispelling of reformist illusions’. I was outraged every bit as much as you were, and determined to do everything I could in unconditional defence of the elected GLC against the unelected Law Lords. It follows as night follows day that if anyone tried to take away the vote, to postpone elections, or anything of that kind, we would be even quicker off the mark than you to defend the elections and insist upon them. But we are talking about change, are we not? At the very least we want to change society substantially in favour of the poor and the dispossessed, and therefore against the interests of the class that controls the wealth and property. And the most extraordinary thing about parliamentary democracy is the degree to which it has been allowed to develop without ever threatening the people in unelected power. This is not because political parties haven’t promised a different system, in their resolutions and manifestos. For eighty years your own party has been making the most amazing promises that it will bring us socialism. In 1923, before it formed its first government, the Parliamentary Labour Party put a motion down calling for laws to enact ‘a gradual supercession of the capitalist system’. And in 1973, you’ll remember, before its last period of government, Labour’s Programme called for a ‘fundamental and irreversible shift of wealth and power towards working people and their families’. In the fifty years in between, there have been promises galore. But there has not been a gradual supercession of the capitalist system. On the contrary, the system has survived extremely well. Have you ever come across a book called The Labour Government and British Industry by A.A. Rogow and Peter Shore? (Yes, I kid you not, the same Peter Shore who now denounces you for fraternising with extra-parliamentary hooligans). The book is a brilliant indictment of the 1945-1951 Labour government, which was the strongest ever. It had a majority of 140 over all the other parties, and it didn’t lose a single by-election in six years. It had the overwhelming support of most of the British people. Yet, as Rogow and Shore show, far from ‘gradually superceding’ the capitalist system, that government carefully nurtured it and built it up strong again – so strong in fact that it was able to gather its forces, regroup, revamp its propaganda and knock the Labour government out of office! Harold Wilson, President of the Board of Trade in that government, masterminded the ‘bonfire of controls’ in 1949 which restored power over industry, which had been placed during war-time into the hands of bodies responsible to parliament, to unelected ‘private enterprise’. He later became your leader and prime minister. He promised ‘a new Britain forged in the white heat of the technological revolution’. Under his first regime, from 1964 to 1970, when Labour again had a handsome majority, pledge after pledge to move to a more equal and publicly-controlled society was pushed aside by actions – forged no doubt, in white heat – for which there were no pledges: freezing wages, doubling unemployment, imposing health charges, and supporting an imperialist war by the US in Vietnam. I won’t annoy you even more by going over the experience of the last Labour government, except to say that in its last three years, from 1976 to 1979, it achieved what no other Labour or Tory government since the war had managed: a shift in wealth and power away from working people and to the rich! And Margaret Thatcher and company have made sure that shift is pretty fundamental and irreversible! You mischievously remind me of a quotation from Karl Marx a hundred and thirty years ago, in a famous essay about the Chartists. ‘Universal suffrage,’ he wrote, ‘is the equivalent of political power for the working classes in England.’ The ‘inevitable result’ of votes for all, he went on, ‘is the political supremacy of the working class’. Yet in our lifetime we have lived through three periods of Labour government, all of them with majorities, in which that supremacy should have been achieved, but during which the propertied class easily held on to its power, its wealth, its influence, and therefore its political supremacy. Your governments and ministers wanted to change society all right. But their power to change things was constantly frustrated by the unelected powers outside parliament. I always laugh when I read in the Tory press about ‘government interference in business’, since the real problem is business interference in government. The methods used are many and various: the run on sterling bringing the collapse of the pound; an investment strike causing loss of jobs in industry; the flight of capital abroad, causing balance-of-payments problems; the Law Lords and the House of Lords preventing parliament passing the measures it wants; the civil service mandarins not putting such measures into action; the independent action of police or prison officers; the mutinies of army officers; the constant barrage of a Tory-controlled media – all of these and others have been used to push Labour governments into reverse gear. Perhaps the most striking metaphor ever used to describe this sad process comes from your former hero Harold Wilson. In his boring account of his second term of office as Prime Minister, from 1974 to 1976, he describes in a sudden flash of an old anger, how the entire economic and industrial policy of his government was changed against its will in the early summer of 1975 (just as soon as he had obliged big business by supporting a ‘Yes’ vote in the referendum on the Common Market). He still hoped, he wrote, to patch up an agreement with the unions which would save him sliding into the wage restraint which he and all his Ministers had so powerfully denounced at two elections the previous year. He writes: ‘We were living on borrowed time. But what of the bailiffs, in the shape of the international financial community, from cautious treasurers of international corporations, multinationals, to currency operators and money speculators? Would they give us time – to win the support of the miners and take all necessary corrective action? The answer came on 30th June.’ The answer was no, in the shape of the biggest slide in the value of the pound in living memory, and Labour and the union leaders were stampeded into wage restraint, into watering down the Industry Bill, into shifting Tony Benn from the Industry Ministry, and all the other familiar sell-outs which you know so well. The bailiffs! What a turn of phrase! Wilson saw his elected government as tenants whose security of policy was subject to the greedy whims of bailiffs. Just as in 1948-1950, and 1966-1970, the unelected bailiffs evicted the elected government from their policy! It is not all that surprising, when you come to think of it. These Labour governments are nothing but a handful of individuals backed by votes. They do not have any real control over industries, services, money, laws, guns or the media. The people who do control these things are ranged implacably against them. By their own logic, the Labour Ministers cannot resort to any ‘outside power’ lest they be accused of ‘anti-Parliamentary action’. So they don’t really stand a chance, do they? And neither do you stand a chance of changing society in the way you want through another such government, however radical its proposals or its commitment. Someone once said that Labour MPs go to parliament to change the world, and by the time they leave (for retirement or the House of Lords) the only noticeable change is in themselves. That’s more than just a joke. The effect of all the compromise, sell-out and humbug that is forced on the Labour Party in parliament is widespread demoralisation both among the MPs themselves and among the enthusiastic socialists who worked to get them there. Just as the House of Lords is stuffed with Labour peers who once swore to abolish it, so the constituencies are full of people who joined the Labour Party for a ‘co-operative commonwealth’, as the old Labour slogan had it, but left it as they watched their heroes shoring up unco-operative capitalist chaos. To go back to your quotation from Marx: I think he underestimated the power of the ruling class, and their will to hold on to what they have in spite of universal suffrage. And there was something else he didn’t anticipate. The pace of elections and of electoral politics is out of step with the struggle between the classes which he so brilliantly described. Electoral politics comes to a formal and unnatural climax every five years or so. Then, and only then, are people allowed their choice. The sensitivity of the elected representatives to those who elected them rises during election times, but in between times it is dulled. Yet in those ‘between times’ tremendous developments happen which can shake the foundations of society. In France in May 1968 a general strike led to the most extraordinary rise in the aspirations of working people. For a few exhilarating weeks it seemed possible that the whole social order could be overthrown, so strong did the workers feel themselves. But the initiative was not seized, and almost in a flash the enthusiasms and excitements of the strike faded into nothing. An election held only a few months later showed a swing to the Right. Yet an election held at the height of the strike would have returned all sorts of ‘extremists’ to parliament. So it is in the interests of the powers-that-be to hold off elections until the people have ‘calmed down.’ Similarly, on a more mundane level, battles in industry, or economic recessions, take place to a different timetable to that of parliamentary elections. And those socialists who call themselves ‘politicians’, who interest themselves only in elections and parliamentary processes, tend to get irritated with struggles which ‘get in the way of their carefully worked-out (but never fulfilled) programmes. So it is that often Labour Party members who led strikes and formed unions before they were selected and then elected to parliament, become, as MPs, at least suspicious, and at worst downright hostile to what they see as ‘mindless (that is, unparliamentary) militancy’. The whole process encourages passivity: ‘Don’t do anything now,’ runs the advice, ‘just wait till the next conference or the next election.’ With all this experience behind us, then, where is the prospect for real change? Is it in getting Labour governments repeatedly elected, however unlikely that may be? Or is it in the activity, and confidence which results from that activity, of the working people themselves? To put it bluntly, I think there is more hope of change in a single strike to save jobs than in a thousand Labour Party resolutions on how to solve unemployment. I think there is more hope for peace in a single mass demonstration against nuclear weapons than in a thousand declarations for disarmament intended to bind a future Labour government. I see more prospect for a better community in a series of local sit-ins and protests to save, say, a hospital or a school, than in a thousand promises from Labour councillors or MPs. For I think that what really counts is the success our side is having in the course of the tussle between the classes, and I think that we have more than enough proof that reliance on elections does not guarantee us any success whatever. Cripps and his supporters in the 1930s argued for extra-parliamentary action both before and after the election of a Labour government to ensure its election on socialist policies and its adherence to them, once in office. Peter Tatchell says something like it today. In a lot of what Tony Benn says there is the suggestion that a future Labour government must be safeguarded against the betrayals of past ones by mass action, strikes, sit-ins, and demonstrations among the workers who elected it. This narrows the gap between us, but the gap is still there. You say that the ‘first priority’ is to get a Labour government elected on socialist policies, and the second to make sure that it is backed by the actions of the rank and file. I say that the first priority is to stiffen the resistance and increase the confidence of the rank and file, and that any parliamentary or electoral politics should be used for that purpose, and be seen as secondary to it. Excuse me just for a moment if I slip into jargon. You are inclined to particularise from the general. That is, you start with your socialist programme and your strategy for electing a socialist Labour government, and go on to say that any particular action, strike, demonstration, agitation should be adapted to that end. I prefer to generalise from the particular, to start with the strikes or agitations and seek to generalise from them into a socialist strategy which can take off from there. How do you think peoples’ minds can be changed? Do you think they will change just through listening to Tony Benn on the television or reading pamphlets and so on? If you stick to the conventional processes of electoral politics, that is to general statements and general arguments, then you are at the mercy of the Tory-run media, which are much better than you at putting and distributing their point of view. When issues seem distant to people, they tend to believe what they are expected or encouraged to believe. But when the issues are close, when they impinge directly on people’s lives, especially when people are engaged in some action in their own interests, then often they see things entirely differently from the way the powers-that-be would like. How does all this relate to the Labour Party and to your determination to ‘stay in the Labour Party in order to change it’? One thing you can’t change about the Labour Party is that it was formed to get parliamentary representation for the trade unions, and that remains its key function however much you change its direction or its policies. And because that is its main function you are always bound by the Gallup-inspired views of people as voters, not as human beings whose views change with their confidence and their ability to affect their own destiny. You are tied down to the business of winning elections, and therefore to chopping and changing to accommodate the right wing. And precisely because of the distance between peoples’ ideas when they are fighting and the ideas which they are simply expected to form in order to vote, the right wing of the party is not only necessary for the party’s survival, it will in 99 cases out of a hundred call the tune. This is shown by the Left’s predicament, which I harped on to your obvious fury in my last letter. You did change the Labour Party. You pushed its policy to the Left; you got a better and more democratic way of electing its leaders; you nearly won a motion that the election manifesto should be written by the executive; you established a system of compulsory reselection for MPs; you enormously weakened the influence of the Parliamentary Party – you had all these triumphs, but after all of them, you find yourself dragged back more sharply to the right than at any time in the history of the last forty years. Why should anyone now believe that the Labour Party can be moved to the left and kept there while it forms a government? But let’s not do that. Let’s come back to your own position. What are you going to do? What I fear is that the electoral priorities of your politics will force you into spending the whole of 1982 in a ceaseless squabble inside the Labour Party; that the non-endorsement of Peter Tatchell, the inquiry into the Militant Group, the refusal of membership to Tariq Ali, will force you to counter-attack by spending hours with your colleagues in innumerable meetings devoted entirely to internal party matters. I know the fact that you are likely to lose will not dissuade you. Judging from your last letter you already acknowledge, for instance, that if Tony Benn fights again for the deputy leadership, the unions will unite against him and he will do much worse than in 1981. If anything, I suppose, such is your stubborn nature, that will inspire you to still more hectic intriguing! What worries me about that is precisely what I have been arguing all through this letter: the distance that will grow between you and the real struggle that goes on outside ward meetings and general management committees. While working around the small disputes of 1981, occupations and strikes like those at Lee Jeans or Laurence Scotts, you wouldn’t think there was a great revolution underway on the Left. A terrific battle had to be waged even for nominal solidarity for these disputes. There were some SWP members I know who got quite angry when they heard of another meeting of 2000 people to listen to Tony Benn in a city where not 20 had been prepared to do anything to help the Laurence Scott workers save their jobs. This was when you were winning. What is going to happen when you are losing? I don’t know whether or not the industrial downturn will go on through 1982. But I do know that there will be struggle, whatever the pitch of it. There will be strikes and occupations and sit-ins and demonstrations. Where will you be with all your grand ideas for changing society? Are you really going to spend your time locked in Labour Party meetings, digging in for long resolutionary trench warfare, waiting to go over the top at the Winter Gardens in October? Surely the least I can do is beckon you out of these futile feuds and into the struggle where it is really being fought. You say that my advice that you should get out of the internal battles of the Labour Party and into the day-to-day industrial struggle is just a cover for saying that you should join the Socialist Workers Party. That is not quite true. Honestly, I wouldn’t expect you to join the SWP straight away. There was a time ten years ago when I thought every socialist who did not join us was either soft in the head or just soft. But times have changed, and even the most diehard party member now realises that people don’t join the SWP easily. So I meant it when I said that my main appeal to you and your fellow supporters of Tony Benn is that you shouldn’t by hypnotised by the struggle ‘for the soul of the Labour Party’, but should try to put your organisation and influence at the disposal of those who are out there fighting to save their jobs and services. But the simple fact remains that in a divided society which is based on the exploitation of working people, the main battleground is at the point of production. That is where the wealth is produced. That is where the workers can most effectively hit back. It is where our collective strength and common interest combine most effectively. It is also, incidentally, the area where the Tories and employers behave most true to type, relentlessly and viciously, and where they can expect their behaviour to be studiously ignored by all the press and television. During the six years I worked full time for Socialist Worker, I covered an enormous number of strikes of every conceivable size in every conceivable industry. I thought my capacity to be shocked would somehow diminish as the years went on. But every time I was absolutely staggered by the contempt with which workers on strike are treated by employers, police, social security officials, and most of all by the media. All of this was, in every case, countered by the quite extraordinary change which came over the workers involved. They grew ten feet tall, unimaginably more able and more resolute than they were in normal working conditions. Often the worst reactionaries on the shop floor became the mainstream of the pickets. Above all, when usually under our influence, the strikers moved out of their isolated dispute and sought help in the broader movement, they started to learn for the first time what being a trade unionist meant. The slogans ‘an injury to one is an injury to all’ or ‘knowledge is power’ or ‘arise ye workers’, which they had seen before only on trade union banners, suddenly came to life. Now all these things – the contemptuous behaviour of the authorities and the growth in stature of the people under fire – can happen in all sorts of other confrontations: in the battles of feminists for instance to clear out the male chauvinism of the media, or in rent strikes such as the Glasgow rent strike of 1915 which forced a government first to introduce rent control. It is also true, of course, that some strikes, though not many, seek to establish reactionary differentials, between workers, or even, in rare cases, to keep a workplace white. But these are the exceptions, not the rule. The rule is that any socialist worth the name identifies instinctively and crucially with workers in industrial struggle. As far as we are concerned, that is, and will continue to be, the most vital area for socialist organisation and propaganda... For it is when workers are strong, and especially when they are fighting, that they are most open to socialist ideas and agitation. I take two examples of something that could be proved over and over again. I visited the occupied Lee Jeans factory at Greenock early last year, as the women’s occupation for jobs was just starting. A lot of the conversation of the young women was about boyfriends, and cooking and women’s magazines. There was a marked deference to the male trade union organiser, and to the few men in the factory. I felt that many of the young women saw themselves to some extent as occupation fodder; that all they could do was to come in on time and carry out menial tasks. Over the next few months, at meetings up and down the country, I met most of these women again. They had changed almost beyond recognition. It was not just their ability to speak out in public, to argue, to conduct collections, to move people into giving more than they could afford. It was their complete refusal to bow down to the humble roles expected of women in a chauvinist and sexist society. They became, not bores or hysterics, but strong and confident women who were not to be pushed around. That was as much part of their struggle as was their struggle for jobs. A second example, quite different. In the autumn of 1974 the IRA, in an act of almost unbelievable callousness and stupidity, set off a bomb in a pub in Birmingham. The massacre of working people that followed shocked the entire city. The following day, as workers came to their factories, there was a powerful, apparently irresistible surge of feeling against any Irish men and women who dared to show their faces. There was an atmosphere of lynch law. I remember talking at the time to two young shop stewards at British Leyland’s huge plant at Longbridge. They found they were forced to argue politics in order to stem the racist tide. They had not just to condemn the bombings, but to put forward solutions, to argue for the unity of Ireland, for pulling the troops out of Ireland. I am sure that the fact that shopfloor organisation was still strong in most Birmingham factories, and that there were socialists inside, to some extent halted the racist advance, and held the peace between people of different birthplaces and accents. Of course the Communist Party in Britain has never had this ‘vast working class following.’ And of course Silone still didn’t find any better answer. He moved rightwards and died a right-wing social democrat. But the charge against the sects is still powerful, and anyone who has spent any time among them knows only too well how exhausting, and sometimes how utterly pathetic is the posturing intolerance of small groups of Marxists who have nothing to fall back on but their own belief that they and no one else are right. The sectarianism of post-war Trotskyist grouplets has much in common with the in-fighting in the dissenting Christian Church in the middle of the last century. There is the same fanaticism, the same polemical hysteria and the same huge distance from the people they try to convert. Perhaps the’ most distasteful aspect of all this is the enormous commitment demanded of new converts. To join the such-and-such party, it is said, means to give up your whole life to the cause. Anything else is bourgeois self-indulgence! It would be silly of me to pretend that the SWP (and its forerunner the International Socialists) had not been infected, sometimes badly, with this disease. There are times in the past twenty years when we have run the other organisations pretty close in sheer bloody-minded sectarianism. But we have been saved again and again by our determination to act where people are, not where we would like them to be. This constant insistence on the struggle as it is has acted as a permanent counterweight against the slide into sectarian irrelevance. Here are two examples. In 1976 and 1977, the National Front were beginning to look like a major political force in this country. They beat the Liberals, for instance, in the 1977 GLC elections. The Labour government was worried but determined to do nothing. ‘Beat them at the polls’, was the advice of the Home Secretary. Intimidatory fascist marches through black areas were becoming more common, by kind permission of the police and the government. The SWP called a demonstration in Lewisham in South London to stand in the way of a fascist march. It attracted a large number of people, and was at least partially successful. But stopping marches, which to some extent we could do as a party on our own, was not enough. Somehow, the opinion of the mass of the people who feared and hated fascism, but perhaps did not realise that that was what the National Front stood for, or at any rate kept silent, had to be mobilised. So we took the initiative in forming the Anti Nazi League. We took the initiative knowing that it would fail unless it attracted thousands of people who did not agree with our party on most other matters. We wanted and sought a broad-based campaign which included people from the Labour Party, the Communist Party, those who opposed racism of whatever party or of no party. The point of the campaign was not to increase the numbers of the SWP, but to stop the Nazis. Again: the Right to Work Campaign, the only real attempt at organised protest against unemployment, and the only consistent mobilisation of the unemployed over the past five years. The SWP started this too. But again, from the very beginning, we did not want or try to take a vice-like grip over the campaign. We sought all the time to involve in the leadership of the Right to Work Campaign rank and file trade unionists who were not, and were not likely to be, SWP supporters. I remember joining one of the marches a couple of years ago in the South Wales valleys. What enthused the marchers was the great well of support which they tapped among the working people of the area. These were Labour voters, of course, to a man and woman: people who had only the remotest concept of the SWP. But their support was sought and welcomed not because we wanted a bigger SWP but because we wanted a more powerful demonstration against unemployment. The greatest insurance against sectarianism has been the will, which I think inspires every single one of us in the SWP, to assist and encourage workers in struggle... We have been dragged away from considering our own navels by real political and industrial pressures and by the demands of real people. That, I believe, is why the SWP grew so much faster than the other sects which were formed in the 1950s or 1960s and which started, if anything, with more members than we did. And that is why we have survived, and even grown slightly, in the past few, very hard years, during which others have either collapsed into the Labour Party or spun themselves a sectarian cocoon from which they can enthusiastically denounce other socialists who have not found their true faith. Let me come back to your predicament. Change does not just happen, and it certainly doesn’t just come because one day Tony Benn might be prime minister at the head of a left-wing Labour government. It comes when people fight for it. And that is why we, with our four thousand members and a fighting newspaper, are more optimistic and confident than you with your quarter of a million paper members, with your resolutions, intrigues, doubts and dilemmas. How much more confident and optimistic we would both be if we were members of the same organisation. And remember, it is no good appealing to me to join the Labour Party. I would not be let in. My application alone would probably cost you a dozen more defections from the Parliamentary Labour Party to the SDP and another couple of points drop in the opinion polls. No, I’m afraid there is only one possible way in which we can now come together: for you to come to us.